Turn special baby snapshots into a creative design they can display. New parents know every moment is worth capturing. This photo art print turns those special baby snapshots into a creative design they can display. Each photo is incorporated into its own iconic alphabet block, which together spell out baby's name. Choose from three color palettes—mid-century modern, primary, pastel—that match any decor, and complete the design with a birthdate, location, or other special message. 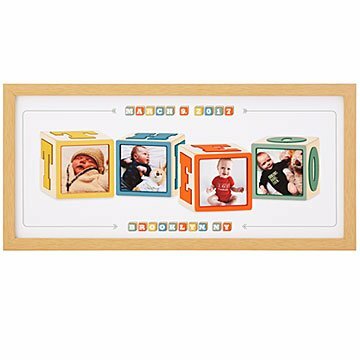 Available in three sizes based on the number of letters, and either a natural or black frame, this playful yet timeless keepsake is one parents will dote on well after their little one is old enough to snap pictures of their own. Printed and framed in Portland, Oregon.